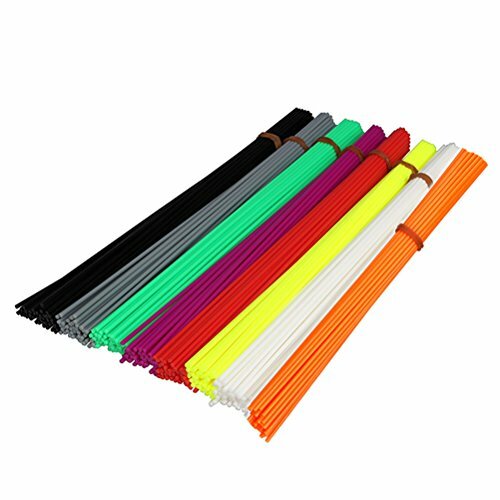 This item isspecialized for most 3D pen or 3Dprinting pen, whichhas great applicability - 1.75mm filament diameter, and good length - nearly 20cm per color, enough length to frame your painting better, and unique material - original PLA materaialis an improvement over ABS.The wide range of available colors and glossy feel make it perfect for display or small household uses. - Color: 8 colors (black, gray, green, purple, red, citrine, white, orange). - Compatible for use in second generation 3D Pen or 3D drawing. - Come with 8 different colors to scribble your 3D artistic masterpiece idea. Color: 8 colors (black, gray, green, purple, red, citrine, white, orange). Compatible for use in second generation 3D Pen or 3D drawing. Come with 8 different colors to scribble your 3D artistic masterpiece idea. No odor, making it better for kid's health. High impact strength, chemical stability, good electrical properties. If you have any questions about this product by UEETEK, contact us by completing and submitting the form below. If you are looking for a specif part number, please include it with your message.